Santa Claus has made it to town - Nicholasville, Ky.
Last week, I wrote of Lexington's annual Christmas tree lighting which occurred the day after Thanksgiving. A week later, exurb Nicholasville had its own Christmas kick-off with its much smaller, small-town atmosphere. It is moments like this that make living in a smaller town so special. A simple tree lighting ceremony was overseen by local officials before a crowd one-hundred strong. After the tree was lit, those gathered on the courthouse lawn peered down the recently redone Main Street. 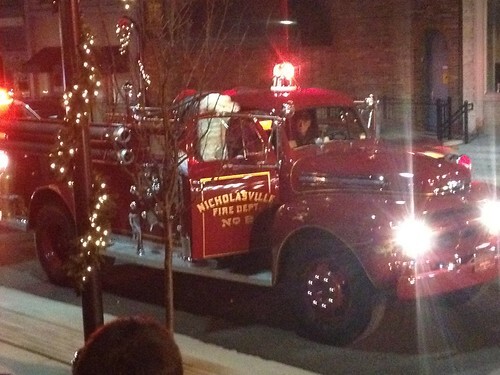 Although reindeer may have been more efficient, Santa Claus patiently took a more terrestrial approach to the courthouse by sitting in traffic aboard the recently restored Nicholasville Fire Dept. Engine No. 2. Engine No. 2, a 1950 model year American LaFrance fire truck, was carefully restored over the past year by local firefighters. In service from 1951 until 1988, the fire truck has since been mothballed until efforts were made to restore beginning in 2010. After arriving, Saint Nicholas walked up the stairs into the Jessamine County Courthouse wherein he took the children's Christmas wishes while the county judge executive helped pass out hot chocolate. The lil' Kaintuckeean, age 3, preferred the Nicholasville celebration to its Lexington counterpart simply because the crowd was lighter. This allowed him to play in the courthouse lawn, an option not available in a at-occupancy Triangle Park. Yes, Lexington and her traditions are wonderful. But Kentucky's small towns offer a quaint simplicity that often goes under-appreciated.